*Applies to eligible members of HM Forces on quotes for new policies only. Discounts will be reviewed on 1 July 2019 and any changes will then apply to renewals and new quotes taken out after that date. Quotes are valid for 14 days. Bupa’s Anytime HealthLine is not regulated by the Financial Conduct Authority. Bupa health insurance is provided by Bupa Insurance Limited. Bupa Insurance Limited is authorised by the Prudential Regulation Authority and regulated by the Financial Conduct Authority and the Prudential Regulation Authority. Arranged and administered by Bupa Insurance Services Limited, which is authorised and regulated by the Financial Conduct Authority. HM Forces Health is a trading style of Private Healthcare Advisers Limited which is an appointed representative of The Right Mortgage Limited, which is authorised and regulated by the Financial Conduct Authority. Financial Services Register number 649443. Private Healthcare Advisers Limited is registered in England and Wales No. 05678788. Registered address: 2 Albany Park, Cabot Lane, Poole, Dorset BH17 7BX. At Forces Health, we understand that if you get ill or injured what matters most is getting back to the things you love as soon as possible. That’s why we’re working with Bupa who offer discounted rates* on the HM Forces BupaCare Scheme, which gives the reassurance of cover from diagnosis through to treatment for eligible conditions covered by your policy. 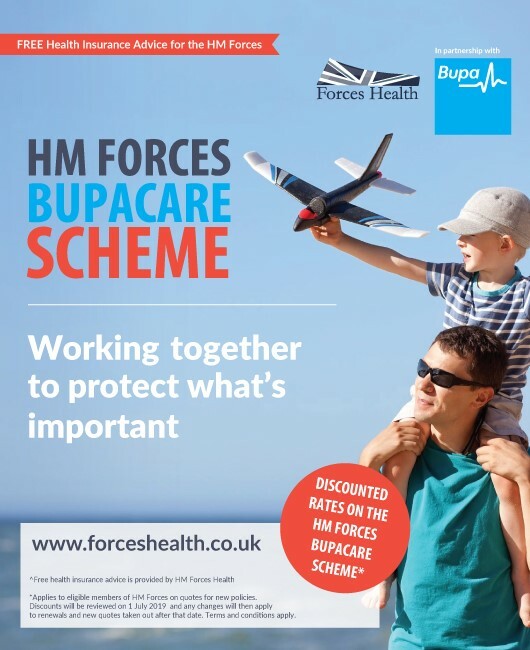 What are the benefits of the HM Forces BupaCare Scheme? For free health insurance advice and a no obligation quote, please call HM Forces Health on 0800 652 2018 (calls may be recorded or monitored) or visit www.forceshealth.co.uk. Terms and conditions apply.